Here at Del Mar Fans & Lighting, we understand how important sleep is and how hard it can be – especially in our modern age with all of the distractions and technological overstimulation. In order to get a healthy amount of rest and feel energized in the morning, a comfortable sleeping environment is key. Having a ceiling fan or standing fan in the bedroom is a popular and efficient way to help relax your body and brain for a good night’s sleep. Today, we’ll be sharing some ways fans can help you get an awesome night’s sleep. White noise is defined as, “random noise with uniform frequency spectrum over a wide range of frequencies,” by Dictionary.com, and is known to encourage deep sleep and help cure insomnia. Whether it’s your bedroom ceiling fan or a floor fan at the foot of your bed, the gentle whir blocks out all sudden variations of sounds during the night, leaving you to feel extra refreshed in the morning. Proper air movement is crucial to any home. Fans are the most efficient way to ensure that the air is constantly moving and creates a more pleasant and safe breathing environment (if you clean the ceiling fan regularly, of course). Clean air circulation helps to prevent mold, dissipate odors, and – if you are one of the many that suffer from allergies or asthma – can remove airborne irritants for symptom relief. Waking up sweating in the middle of the night is a common problem. According to a study from Sleep.org, our brain’s temperature-regulating cells turn off during REM sleep, causing your body temperature to be determined by your bedroom temperature. So, how can you keep cool without turning your air conditioning down to bank-breaking temperatures? Greatist’s tips to sleep in the heat article has many solutions, including: cool sleeping attire, a light comforter, and the proper use of fans. 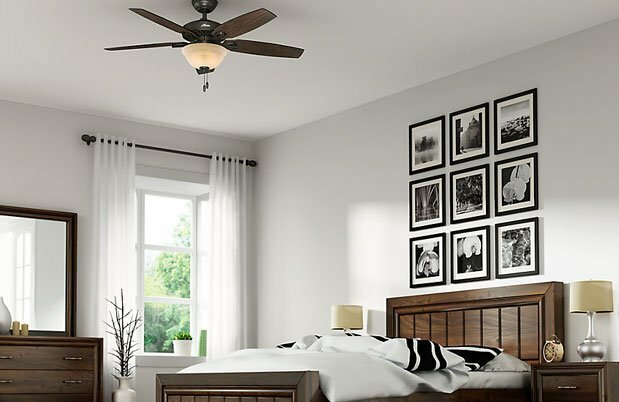 Using multiple fans in your bedroom to create a nice cross-breeze helps with dissipating heat. Another simple solution is to run your ceiling fan counterclockwise (along with your air conditioning) to pull the hot air away from you throughout the night. There are many high-quality, relatively inexpensive fans available. There are even specialized fans designed with built-in technology to create a soothing sound that promotes relaxation and air movement conducive to rest, like the Savoy House Sleep fan. We hope that these ideas for using fans in the bedroom can help you achieve the quality night’s sleep you’ve been looking for. Del Mar Fans & Lighting can help you find your perfect sleep fan, as well as a bedroom lighting plan – give us a call if you have any questions (800) 724-5501 – we’ve got you covered!